I was sitting at the dining room table with my husband and I told him I had prayed a novena to St. Therese and asked for a sign. “What do you mean a sign?” he asked. At the age of 14, on Christmas Eve in 1886, Therese had a conversion that changed her life. 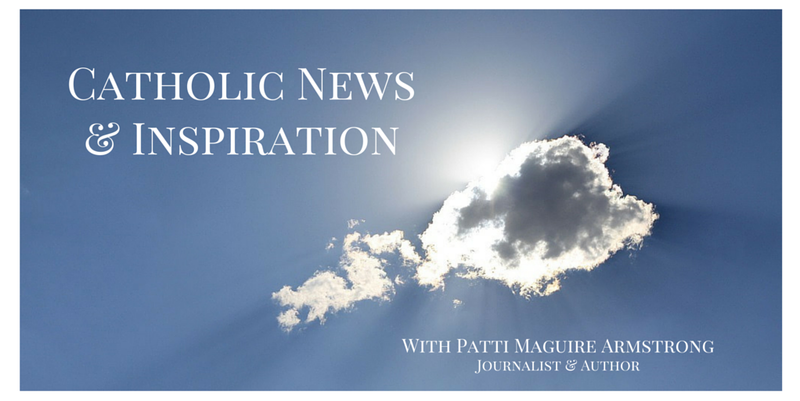 At 15, she became a Carmelite contemplative nun at a convent in Lisieux, France. She took the religious name Sister Therese of the Child Jesus and the Holy Face. After a long sickness with tuberculosis, she died on September 30, 1897, at the age of 24. Her last words were: "My God, I love You!" Her feast day is October 1. She was canonized by Pope Pius XI on May 17, 1925. Therese became known around the world through her autobiography, Story of a Soul. People learned of her "little way" in which she lived each day with complete confidence in God's love. She explained that what matters most "is not great deeds, but great love." She became known as the “Little Flower” because she loved flowers and saw herself as the "little flower of Jesus," among all the other flowers in God's garden. 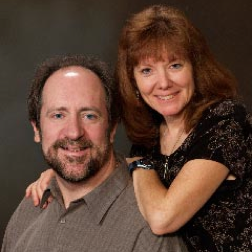 “My mission - to make God loved - will begin after my death," she wrote. "I will spend my heaven doing good on earth. I will let fall a shower of roses." People often report receiving roses after praying to Saint Therese, especially after praying a novena to her. Last year, my sister Colleen and her friend Debbie and I visited Canton, Ohio, home to Mother Angelica and Rhoda Wise, whose cause for canonization has been opened. 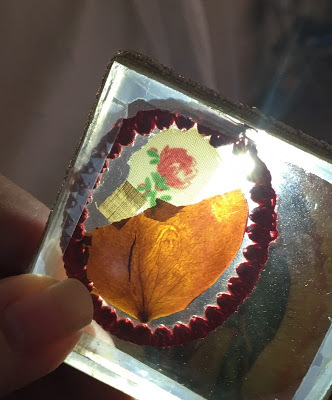 We visited the Rhoda Wise Shrine as part of the Mother Angelica Tourand saw one of the miraculous rose petals from St. Therese. In 1939, Rhoda was miraculously healed from an abdomen opening that could not be closed after multiple surgeries, and she was later healed from a severe foot injury. She had a special devotion to St. Therese and prayed to her often. Mother Angelica was actually healed of a debilitating stomach problem as a teenager after visiting Rhoda and praying a novena to St. Therese as Rhoda had instructed. 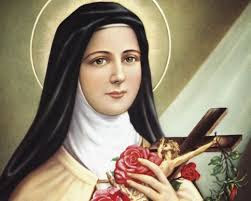 Both Jesus and St. Therese had appeared to Rhoda several times. 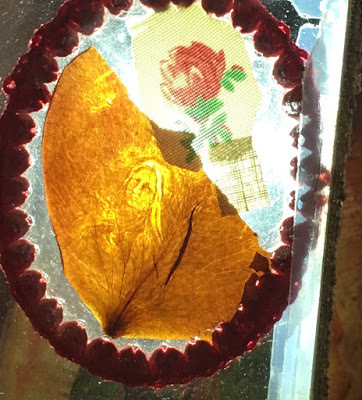 On January 8, 1940, about 1:30 a.m., the Little Flower appeared for the second time to Rhoda and dropped seven fresh rose petals on her and told her to have them photographed. When she did there were images of Our Lord and the Little Flower in the rose petals. The picture of the rose petal I took with my cell phone, while Colleen used the flashlight of her cell phone on the other side. St. Theresa can be seen, holding a crucifix in front of her, and Jesus is looking upon her right in front of her. When the petal is turned over, the identical image is there with St. Therese facing out, looking in the other direction. And when it comes to receiving roses from St. Theresa after praying for her intercession, I am cautious and never expect such things, but am open to whatever God chooses to allow.